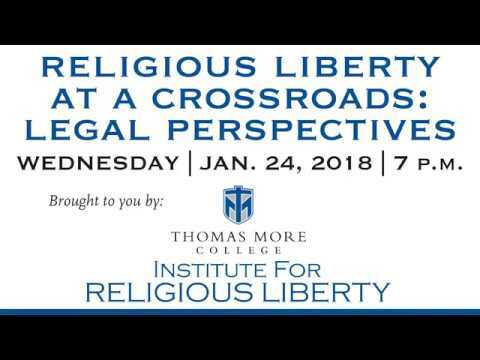 The Thomas More College Institute for Religious Liberty (IRL) presented the event Religious Liberty at a Crossroads: Legal Perspectives on January 24, 2018 in Steigerwald Hall on the Crestview Hills Campus. Established in 2015, the mission of the IRL is to advance the American concept of religious freedom as an unalienable right and the protection of this right for all people. Headed by Executive Director, Raymond G. Hebert, Ph.D., Dean of the College Emeritus, the Institute strives to accomplish its mission through education and dialogue in the form of academic symposia and lectures featuring internationally renowned speakers. This year’s event looked to the legal aspects of religious liberty and featured Keynote Speaker Kevin C. Walsh, J.D. Walsh is from the University of Richmond School of Law, and currently teaches and writes in the areas of federal jurisdiction, constitutional law, and religious liberty. His scholarship explores the doctrines that define—and delimit—the scope of federal judicial power. He graduated from Harvard Law School, where he was Articles Chair for Volume 115 of the Harvard Law Review. After graduation, he clerked for Judge Paul V. Niemeyer of the United States Court of Appeals for the Fourth Circuit and Associate Justice Antonin Scalia of the Supreme Court of the United States. He then practiced law at Hunton & Williams LLP and taught as a visiting assistant professor at Villanova University School of Law. He was on the legal team representing the Little Sisters of the Poor in their religious freedom challenge to the Obama Administration’s contraceptives mandate. Walsh received his A.B. from Dartmouth College, and an M.A. in Theological Studies from the University of Notre Dame. After the keynote address counterpoints were presented by two speakers. The first was Frederick Mark Gedicks, J.D., who is the Guy Anderson Chair and Professor of Law at the J. Reuben Clark Law School of Brigham Young University, where he has taught constitutional law, freedom of religion, and philosophy of law since 1990. Gedicks has published and lectured widely in the U.S. and Europe on the nature and role of religion in contemporary public life, including three books, Choosing the Dream (Greenwood, 1991), The Rhetoric of Church and State (Duke, 1995), and Constitutional Law and Religion (West Academic, forthcoming 2018). Gedicks was also principal author and counsel of record on a widely publicized amicus brief for himself and other church/state scholars in the Hobby Lobby litigation. His current projects involve justifications for and limits on religious exemptions, and challenges to the philosophical bases for originalism as a constitutional interpretive method. The second counterpoint speaker was Ilya Shapiro, a Senior Fellow in constitutional studies at the Cato Institute (a public policy research organization dedicated to the principles of individual liberty, limited government, free markets, and peace) and editor-in-chief of the Cato Supreme Court Review. Before Cato, he was a special assistant/adviser to the Multi-National Force in Iraq and litigated at Patton Boggs and Cleary Gottlieb. Shapiro has contributed to many academic, popular, and professional publications and regularly appears on TV and radio. He periodically testifies before Congress and has filed more than 200 “friend of the court” briefs in the Supreme Court. Shapiro clerked for Judge E. Grady Jolly of the Fifth Circuit and holds degrees from Princeton, the London School of Economics, and the University of Chicago.